We've got whatever it is that's going around, so we have to lie low today in our sick bed. 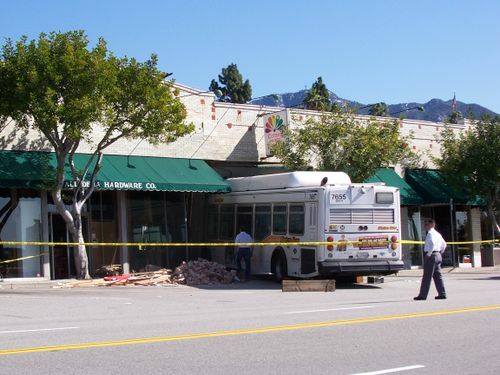 However, some of our correspondents have alerted us to an MTA bus crash into Altadena Hardware this morning before 6 AM. Fortunately, it doesn't appear that anyone was injured. UPDATE 11 AM: We dragged ourselves out of our sick bed and took some pictures (below). Also ran into Lance Anderson, whose Altadena Junction is in the same building and was planning its grand opening this weekend -- Lance says that there's some fear that a main building support was taken out, so the opening will have to be postponed. Here's PSN's story filed at 8:22 this morning. 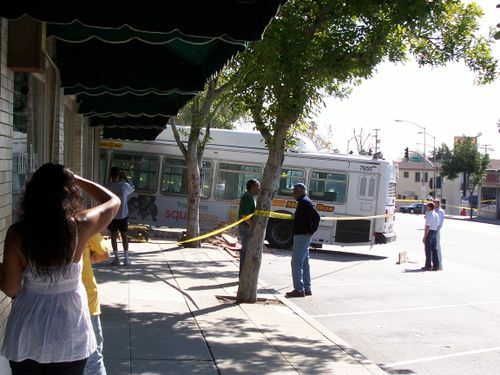 They say the bus was towed away, but we just drove by at 2 PM, the bus is still there, and it ain't gonna move for awhile.